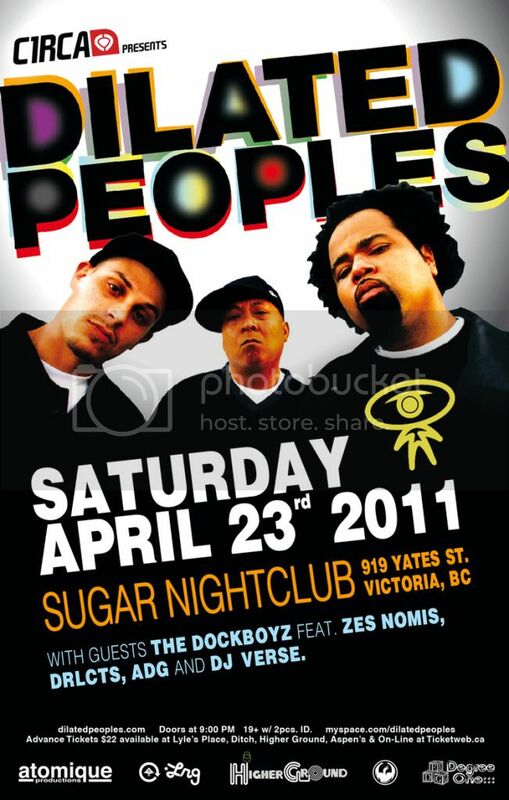 Degree One Events: DILATED PEOPLES at SUGAR in VICTORIA. DILATED PEOPLES at SUGAR in VICTORIA. The Dockboyz feat. Zes Nomis, DRLCTS, Adg and DJ Verse. As hip-hop culture (DJing, MCing, b-boying, graffiti art and beatboxing) evolved in the late 1970s and early 1980s, two things were hallmarks of the movement: DJing and lyrical excellence. In the last several years, no rap group has done more to champion those elements than Dilated Peoples. The Los Angeles-based trio of Rakaa, Evidence and DJ Babu inject their music with humor, insight and social commentary, and DJ Babu’s cuts add an additional layer of excitement and complexity to the group’s material. Dilated Peoples have managed to perform amazing feats on the thin line between underground and mainstream. Though they made much of their name performing live on the international club and festival circuits, they are also revered for their bona fide Hip Hop classic records like "Worst Comes To Worst" (feat. Guru) and "This Way" (feat. Kanye West and John Legend). They have also made worldwide names for themselves as solo artists with Evidence's The Weatherman LP and The Layover EP; DJ Babu's Beat Tape Instrumentals and Duck Season series; and Rakaa dropping 2010's critically acclaimed Crown of Thorns album and staying in global demand as an event host. Always soldiers for the cause and supporters of the movement -- Dilated Peoples are bringing that Boom Bap sound back to Canada with their first EVER concert on Vancouver Island March 23rd. at Sugar Nightclub in Victoria.... don't front, don't sleep... get yo tix ASAP.